This is an A5 size card that I was asked to make for a teacher who was retiring, she played the piano and quite liked her wine. The card is three layers thick stuck together to make it strong and the children wrote their names on little music sheets. 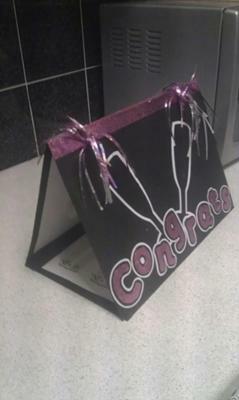 The front letters were hand drawn and cut then covered in pink foil type paper then backed again, they feel puffed up. The cocktail glasses were hand cut and for the cocktail sticks I cut strips of pink paper foil and attached to kebab sticks. The piano is card cut and folded, with piano keys drawn on, the black keys were made separate and attached. The card developed as I went along I did not plan it, I just knew a piano was required somewhere in/on the card. What a novel card and how clever of you to put it together. I am sure that the retiring teacher will treasure it for years to come ... especially with all the signatures on it. This card is truly unique!!! !,it must have taken you hours! 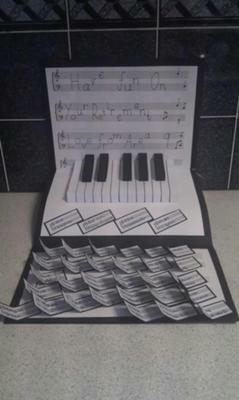 I love how you got the children to put their names on the music sheet pieces and the piano is great! You are a very patient woman to wrap pink foil around the sticks to create the wine glasses! I am sure this card will hit home with the music teacher... I really enjoyed reading about this card. What an unusual card , I love it, well done. brilliant card so apt and very personal. This is what I call a hand made card. Brilliant! !